Between Hurricane Harvey’s devastating path through southeast Texas and spiraling tensions with North Korea, which may now have advanced hydrogen bombs, it’s become pretty clear Earth and humans are in a race to see who can usher in the apocalypse quicker. Another point in Mother Nature’s corner: The largest wildfire in Los Angeles history, the 5,900-acre (2,400 hectare) La Tuna Fire, has continued to spread and is only 10 percent contained as of Sunday, Reuters reported. 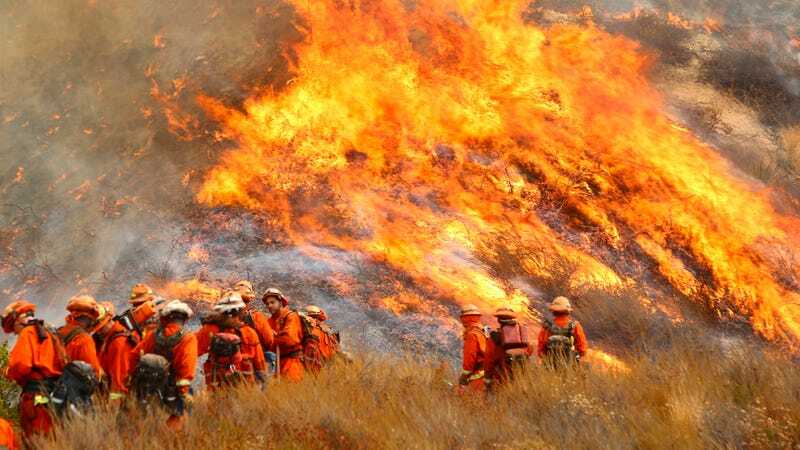 According to CNN, more than 1,000 regional and California firefighters have been deployed to fight the blaze, and Gov. Jerry Brown has issued a state of emergency declaration in Los Angeles County. Reuters noted 700 homes in Los Angeles, Burbank and Glendale were evacuated. Terrazas noted temperatures in the area were a blazing 100 degrees Fahrenheit (38 degrees Celsius), which was their “number one concern.” But he added the weather is projected to cool to a slightly less hellish 90 to 94 Fahrenheit (32 to 34 Celsius) through Sunday afternoon. Climate scientists have long suspected a direct link between the Earth’s rapidly warming climate and increasing bouts of extreme weather, and recent research has provided significantly more hard evidence. But while demonstrating a link between storms like Hurricane Harvey and human-induced global climate change has been difficult, the link between rising temperatures and wildfires is much simpler. According to Scientific American, Western wildfires have risen some 500 percent since the 1970s, with record temperatures obviously connected to devastating droughts and increased fire vulnerability. “Climate change has exacerbated naturally occurring droughts, and therefore fuel conditions,” NASA’s Goddard Institute for Space Studies researcher Robert Field told the magazine.